But many economists are not optimistic that less regulation will turn the flagging industry around. GILLETTE, Wyo. — This hardscrabble Wyoming city of about 30,000 people proclaims itself the “Energy Capital of the Nation” on the mayor’s blue blazer and even the parking ticket payment boxes. Nearby are some of the world’s largest open-pit mines, where dump trucks the size of houses haul out more than 40 percent of the coal produced in the U.S. The wide-open landscape around Gillette also has reserves of natural gas, oil and uranium. So when President Trump lifted a federal coal leasing moratorium and ordered a review of greenhouse gas regulations, the announcement electrified many workers here who depend on fossil fuels for their livelihood. After years of layoffs and corporate bankruptcies, they are optimistic that jobs and a better economy will soon return. “It’s not all rosy right now. But anytime you can see the future and know that the United States, you know, is working with you rather than against you, that alone is nice,” Gillette Mayor Louise Carter-King said. She predicts the community will “come out of this bigger and better than ever” thanks to clean-coal technology and overseas exports. But the skepticism expressed by many economists and energy experts throughout the campaign has not eased. They say the global coal market has little room for more coal from Wyoming and especially from Appalachia, where mines are not just scaling back but closing. Nationwide, the coal industry has shed some 60,000 jobs, or more than 40 percent of its non-office workforce, since 2011. “Utilities are just staying away from coal. So that hasn’t changed. That didn’t change after the election, and it hasn’t changed since the executive order,” said Rob Godby, director of the Center for Energy Economics and Public Policy at the University of Wyoming. Academics with doctorates aren’t dampening Gillette’s newfound optimism for Trump’s order. Last year, in fact, was the worst for U.S. coal production since 1978. Utilities continued to switch to cheaper and cleaner-burning natural gas, and the cost of wind and solar energy continued to decline. Around here, President Barack Obama’s regulations got much of the blame. Trump reaped the benefit, winning Wyoming and another coal state, West Virginia, by his widest margins in the nation. Within Wyoming, Trump won biggest in Campbell County, which includes Gillette. On Tuesday, he repaid the favor by announcing he would review Obama’s Clean Power Plan and lift the 14-month-old coal leasing moratorium. 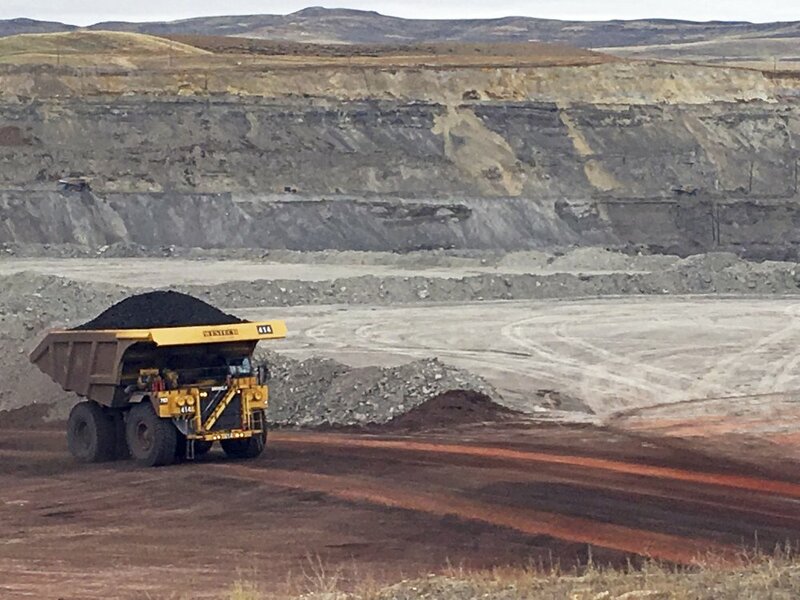 Stacey Moeller, a shovel operator at Peabody Energy’s Caballo Mine, said the changes will put coal back on a level playing field after Obama tipped it in favor of renewable energy. The federal government owns nearly all of the coal reserves in the Powder River Basin and leases them to companies to mine. Even before the Obama moratorium, market forces had all but halted new leasing. To many, the measure seemed like insult on top of injury. Last year, around 500 miners were laid off as several large mining companies went through bankruptcy. Whether Arch Coal, Peabody or Contura Energy rehire workers or resume significant leasing remains to be seen. But business is already brightening at some of the heavy machinery dealerships that line a Gillette road where they sell excavators, bulldozers and other equipment to the mines. The perk-up began the day after the election, when a couple of customers placed orders to complete projects they would have abandoned if Democrat Hillary Clinton had won, said Richard Chafee, general manager of Jack’s Truck & Equipment. Still, the coal critics aren’t limited to scientists and scholars. On the Turner Crest Ranch, greyish-orange clouds from mine blasting appear on the horizon like clockwork. Ranchers Karen and L.J. Turner have little good to say about Black Thunder and the other huge mines near their place, which they blame for their creeks and wells running dry. “I think all these people that are hanging on for dear life to their coal mining jobs ought to, you know, see the writing on the wall and say, ‘OK, what can I do?’ Something else,” said Karen Turner, who like her husband is a lifelong Democrat. Economists tend to agree, pointing out that the cost of renewables will continue to decline and their appeal will continue to grow along with global interest in reducing greenhouse gases. The prospect of low-carbon coal, meanwhile, remains far off, even as Wyoming and other states team up on a carbon-capture lab under construction at a power plant near Gillette.